across the street from Sejong Arts Center (by Gwanghwamun). As the colonial period finally ended on August 15 1945, stirrings in preparation for a new society were seen throughout the Korean Peninsula. The effort to establish a proper national framework was not confined to independence fighters or political leaders. Journalists, publishers and intellectuals, whose freedom of expression was denied during under the Japanese imperial regime, began to raise their voices over the path in which the country should proceed. Laborers and farmers strove to protect their production sites, which served as their economic foundation amidst the chaos. They struggled to gain their social rights in the face of copious restrictions. Numerous cultural artists and groups also worked tirelessly to comfort the hearts of people who had suffered during the former regime as well as to share in the public enthusiasm over the dawning of a new society. The three years needed to establish a government formally after Liberation was a time of political chaos. Ideology is neither simply an issue for social leaders alone nor something dichotomously split into left and right political camps. Voices on all sides of the dense ideological spectrum were raised until the social leadership had emerged from the people, and the Korean people had finally become the principal movers of their own society. The presence of such disparate opinions amplified the conflict, but the melee was not just over points of view. Political positions and ideological differences notwithstanding, the contemporary figures who strove to stand on their own to establish the new order were all driven by the same level of resolve and passion. The establishment of the Republic of Korea government in August 1948 was made possible by this collective energy. 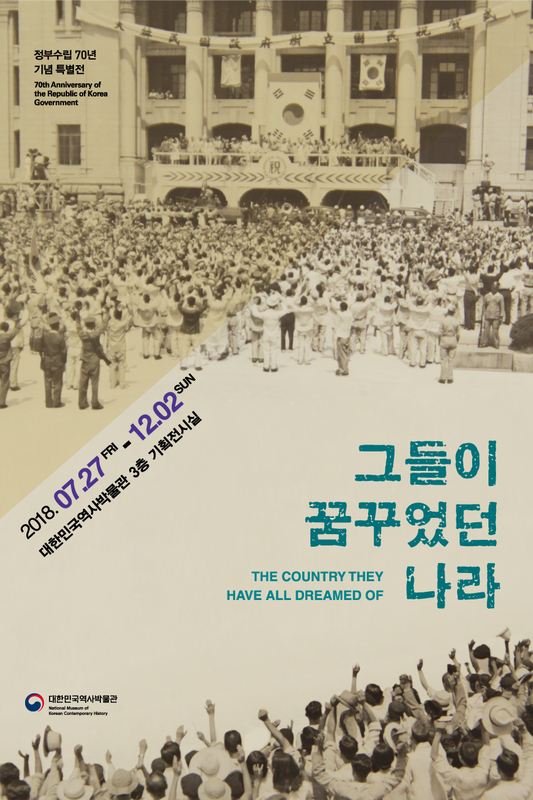 The present exhibition covers the period between Liberation from Japanese colonial rule in August 1945 to the establishment of the government in August 1948, focusing on the new social vision for which diverse sectors of Korean society yearned as well as on the determination and exertion put forth realize that vision. Disparities existed in the degree of individual resolve and effort, but visitors are encouraged to recall the kind of nation the people back then were dreaming of, while embracing the differences among them. Let us look back upon the starting point of the government of the Republic of Korea seventy years ago as well as upon the aspirations and dreams of those who were there. Now in 2018, the world is experiencing a historical turning point, and we should take time to reflect upon ourselves yet again. All Spaces Are Filled! No more people can join due to Museum limitations.